The only Hoverboard seat that does not need an hoverboard!! what do you get when you fuse a 2x400watt motor, Samsung battery, Bluetooth Speaker, Smart app and infrared sensor for millisecond reaction time to an Hoverkart frame, you get the future of hoverkart, THE SMART HOVERKART OR HOVERKART 2.0. ITS FASTER , SLEEKER , LIGHTER AND ALSO, SMARTER! The Smart Hoverkart is the latest Hoverkart in the market Revolutionising the way you view hoverboard , swegway or two wheeled balance board forever! 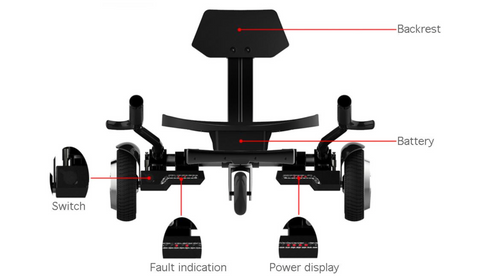 Never worry about trying to keep your balance again as you’ll sit directly above the Motor with control leavers that control your every movement allowing you use the smart hoverkart to move in all directions with speeds of up-to 15 miles per hour. Smart Hoverkart is different from other models as it is not merely an Hoverboard seat or attachment but a completely different Beast!! The entire structure consists of two main frame, one seat and pedal lever. The left and right frames are connected to bearings through steel tubes, and driven by four bearings, resulting in the best flexibility and bearing. The pedal lever has four shifts to adjust its length and adapt to different body shapes. The latest Version 4.0 bluetooth, with ultra long effective link distance.